How could two submarines end up colliding in the middle of the ocean? British military types are blaming excessive stealthiness, and the French claim they didn't realize what had happened for days. It is remarkably difficult to detect a modern submarine with sonar and we work very hard with our own submarines, as do our allies, in making them as quiet as possible so they are not detectable. And he's serious about that—even after realizing they'd hit something, the French crew couldn't tell what it was. They wrote the object off as a shipping container, only to find out that they had actually collided with another submarine upon docking three days later, after the government had deduced the collision from routine information exchanges with the British. 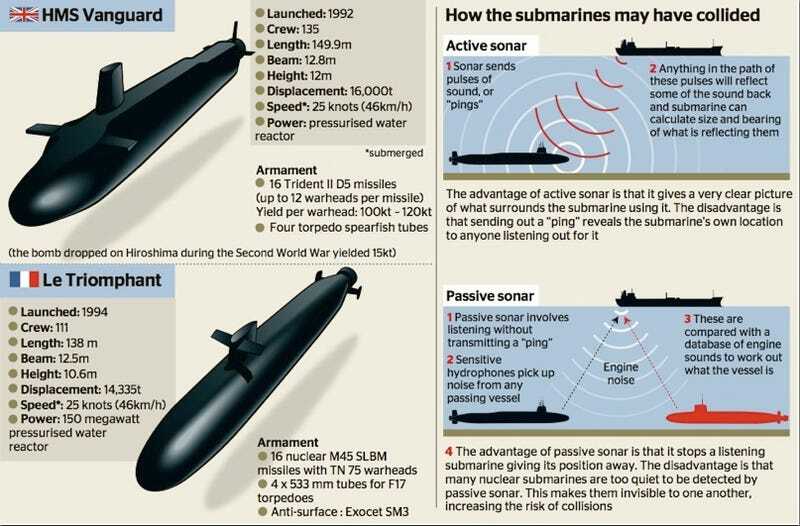 The problem was that both submarines use passive sonar to map out their surroundings, which doesn't give away their location with the 'pings' of active sonar, and is somewhat less sensitive. Without these 'pings', it was nearly impossible for either sub's passive sonar to detect the other's, leading to the collision and subsequent confusion.